The 8th Annual FabLearn flagship conference on Maker Education took place at Columbia University, New York on 9th – 10th March. The conference theme What Role does Maker Education Play in a World with Growing Social and Environmental Challenges attracted over 400 educators, stakeholders and researchers from 23 different countries to participate in inspiring lectures, workshops and poster sessions. From Finland there were three Innokas Network presentations: one poster in Educator track (by Raini Sipilä, Kati Sormunen and Tiina Korhonen), one student poster (by Matias Ola, Sini Riikonen, Tiina Korhonen and Kati Sormunen) and one short paper (by Tiina Korhonen, Laura Salo and Kati Sormunen). Columbia University is one of the oldest universities in US, established in 1754. It is also a former university of John Dewey whose idea of learning by doing doesn’t get old. During the conference the audience was challenged to ask themselves questions about ‘who is making?’ and ‘why making?’. Keynote speaker Sylvia Martinez highlighted the word ‘making’ from different angles. Interesting part was her prediction on Future: biotech is the new digital – we will move forward from cyberphysical to cyberbiological future. Martinez also emphasized sharing as the best way to ensure understanding. She encouraged teachers to empower their students to understand their capability to control machines and therefore affect to their own future. Amanda Cox, the second keynote speaker, came from The New York Times. Cox is a data editor and she is responsible for both written and visual content in NYT. Ms Cox spoke about scale, context, patterns and annotation levels and how these are shown in digital way. In digital newspaper settings are able to create interactively: the reader is able to affect how or what she/he sees and reads. Amanda Cox said, it is important to transform data into a form in which it is more understandable – for example data is put into familiar environment. Panels on both Saturday and Sunday were more or less representatives’ presentations on their projects. All discussion topics were related with making somehow: Making in an age of social unrest, Making without destroying the planet: is it possible?, Making for film and theatre and Making around the world: Experiences and lessons learned. For me the most fruitful panel was the last one: educators from six different countries shared their experience on maker culture on their own country. Significantly important notice is, that nobody works alone. Everything is made in collaboration with other people. Short and full papers were written together, young makers and educators had worked with teams to get their presentations to the conference. My visit with Innokas Network experts was amazing. My mind and understanding grew because of the conversations I had with all kinds of people. People who seemed to be as interested in making and designing as I am. This time teachers and school developers from Denmark and Finland gathered in Bedford for a week in October. The week was full of different school visits, great conversations about the English educational system and observation of the three T’s (time, talent and technology (and trust)). Our visit to England started with a reunion in a local restaurant. After a fun evening together it was time to start the activities. On the first day we had a chance to visit the University of Bedfordshire. It was very interesting to hear about the English school system. We spent the next days in different schools where participants got to know the school, observe lessons and even teach microlessons. The last day of the week provided again an opportunity for each delegation to present their thoughts and reflections to each other and discuss together. When discussing technology we found similar things that came up in both Finnish and Danish reflections. For us technology education in England seems like a separate entity from other education. This led to discussions about how to integrate technology in schools in order that it would be helpful and useful in pedagogical way. Reflections on talent included discussions on grouping of pupils and ranking. One big topic was also trust. We noticed that headmasters trust their teachers but the lack of trust is evident from the government’s side and that leads to ongoing testing and registrations. In a time perspective we talked about structured lessons and classrooms. Everything seemed to be very structured and that was one thing that was different from Finnish schools where we don’t have strict schedules and pupils may have just one or two tasks per lesson. Overall our visit to Bedford was great and we learned a lot about the English perspective to education and at the same time gained new insight into our own system. This entry was posted in Learning, Partnership, Schools, Teachership on November 5, 2018 by hankeopettaja. 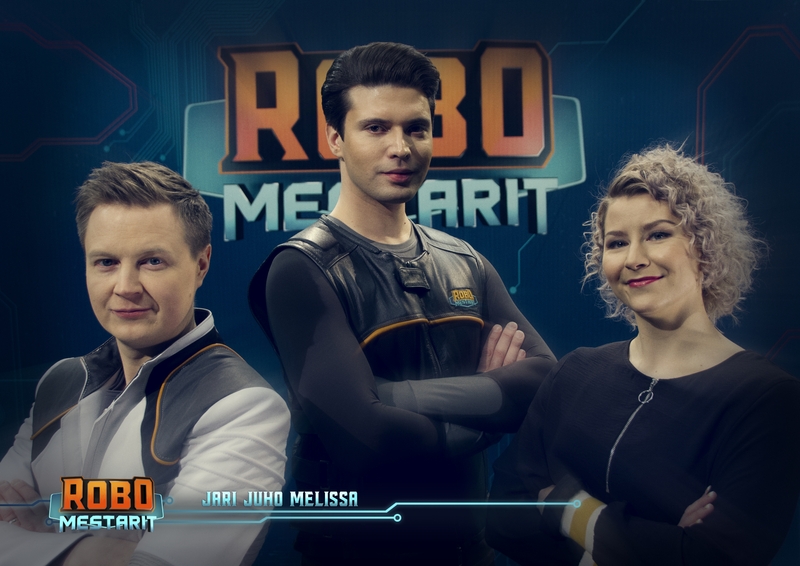 Since the beginning of April YLE has broadcasted a tv-show called Robomestarit. It airs every Sunday morning. It is a production based on the idea of a robotics tournament designed by Innokas-network. It aims to present robotics and coding while also showing what they make possible. At the same time the show is both entertaining and pedagogical. Last weekend we got to see the finals of X-Sumo and Rescue and who won the competitions. The last episode of the show will be aired next Sunday. For both Freestyle and Dancing with robot it is time for the finals! 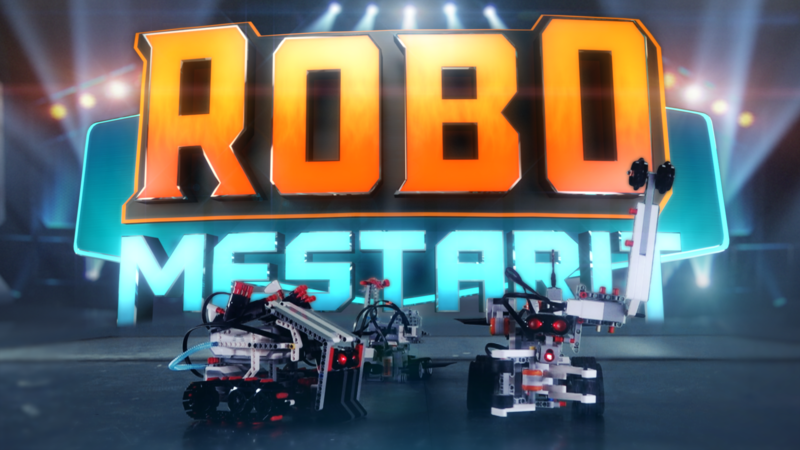 The different competition tracks of Robomestarit are based on Innokas-Network’s robotics tournament which is held every year in different cities. This year it takes place in Tampere, 14th to 16th of May. The tracks are Pelastus (Rescue), X-Sumo, Tanssii robotin kanssa (Dancing with a robot) and Freestyle. The last mentioned has three teams competing in different challenges every week. . The winner is announced in the last episode. Dancing with the robot is a different kind of track. If you want to win you need to do it on social media and get the most votes. X-Sumo works as a cup where two teams put their robots to the test of strength in robo sumo-wrestling and winner continues in the race. Rescue track puts the robots in different kind of situations where their mission is to transport a fuel tank to the space ship. The teams taking part come from all over Finland. Most of the participants are 5th or 6th graders but there are some exceptions. Many of the teams have won their regional preliminary competitions and this is their final step. Every episode lasts about half an hour. Naturally most of it is about the competitions but there is also much more to see and learn. One of the show’s presenter, Innokas-Network’s educator Juho Kemell has visited different kind of working environments that have robots. Those visits are an educational peek to the importance that robotics have in problem solving. While of course it is interesting to just watch the show the viewers also get to take part through social media and open challenges. Best viewer challenge participants get their videos shown in the program. Every episode has also an educational part, the ABC of coding. It teaches the very basics of coding and getting more into detail every episode. Don’t forget to check out their YouTube channel with interesting extra content. This entry was posted in Uncategorized on May 23, 2018 by Ilmari Hannula. Visiting the filming of Robomestarit! At the YLE (Finnish National Broadcasting company) studio in Tampere adults and kids are moving smoothly between the lobby, dressing room and studio. The filming of the Robomestarit tv-show has started. The day starts when the presenters and the teams arrive. Last minute corrections are made to the outfits and people are getting familiar with the studio. The children seem really excited in their cool custom-made outfits and the atmosphere is electric. The schedule shows minute by minute what is going to happen during long day which ends in the filming of the actual episode. In addition to the filming in the studio, the day also consists of group and individual interviews. One of the presenters of Robomestarit, Juho Kemell, works as an educator in The Innokas Network. He has arrived early in the morning to get ready for the day’s filming. -“It has been quite a hassle which means it will be a great day!” Some material has been filmed before today. 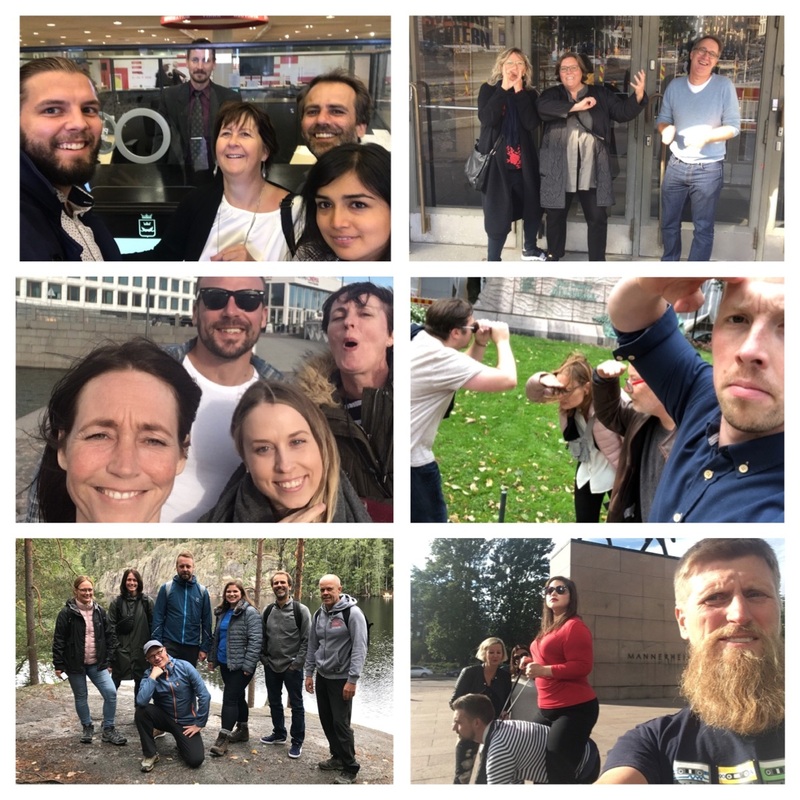 Juho and the crew have been visiting different kinds of companies during the last couple of months and observed different robots used in various industries. The judges are also preparing for the day and going through the most important rules regarding the upcoming contests. -“It is an awesome show!” says Erkki Hautala, an X-sumo judge and Innokas Network’s educator while guiding the teams to test and prepare their robots. Melissa Kaivo, known to children from the TV-show Galaxi, is also a part of the production. She is one of the presenters and a travelling journalist who visits the teams’ schools. She thinks that the live-aspect of the show is very exciting. Not everything is filmed beforehand thus letting all of the viewers, teams and presenters really live through the show throughout the spring while the show airs. She also thinks it is cool that the viewers get to influence and take part in the program through social media. The fog machines are blowing in the studio and the atmosphere is almost too impatient. The audience, teams and the presenters are ready. Lights, cameras, applause! What happens after this can be seen on YLE channels or YLE-areena. The Innokas Network and YLE are putting together and filming an 8–episode long TV-show Robomestarit in the spring 2018. The Robotics Society in Finland is supporting the production with the real–life examples. The show is based on Innokas–Network‘s robotics tournament which is held every year. In the competition school age children take part in different competitions and do problem solving using robotics. For example, “Dancing with the robot” and “X-Sumo“ (Sumo wrestling for robots). You can find more about the show and the broadcast schedule from The Innokas Network’s webpage. Or visit https://yle.fi/robomestarit/ or YLE streaming service https://areena.yle.fi/1-4356057 at this moment all material is unfortunately available only in Finnish. This entry was posted in Uncategorized on May 11, 2018 by Ilmari Hannula.